When Fiery Imp attacks, deal 2 damage to your opponent. 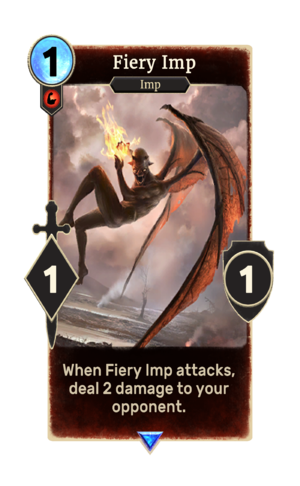 Fiery Imp is a rare Strength creature card. It is part of the Core Set. In addition to the card's availability in the Core Set, two copies are included in the Warriors of Hammerfell deck, one copy in the Aela's Companions theme deck, and one copy in the Band of Survivors deck. Imps first appeared in Daggerfall, and later reappeared in Oblivion and ESO.